I often wonder if our ability to show the deeper unsettling vistas which lurk in the human psyche hasn’t in some way desensitised us to those once dark and forbidding regions. Where once Cronenberg’s visions of visceral body horror would be greeted with an appropriate level of discomfort, a process of mental denudation has left modern audience with little more than a numb region where fear once held sway. This creates a problem when trying to catch echoes of an audience’s original reaction to a particular work. 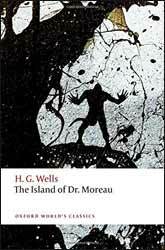 The Island of Dr Moreau (1896. 125 pages), by H. G. Wells suffers the twin problems of losing much of its impact as societies scientific and religious context changed and the legacy of, frankly, a series of rather appalling series of attempts to adapt it for the movie screen. The story follows an account of Edward Prendick who has the misfortune of being shipwreck only to have the further misfortune of ending up on the eponymous tropical isle. There he meets first Montgomery and then his boss Moreau. Moreau is a vivisectionist at a time when the science was in its infancy and so Wells could, erroneously as it turned out, speculate that this ability to rearrange flesh could give rise to the creation of hominoid animals, thorough a process of pain. Whist Wells felt that his book contained a central core of plausibility advances in science have proved that the book's central conceit would never rise above being just a fanciful idea. Much of the horror, which this would have engendered in the original audience, has been diluted by the passage of time. On its original release the book smashed against a wall of criticism. Was Wells suggesting that man would, one day, take the place of his creator in creating creatures in his own image? Although this condemnation was levelled at the book, I think that this was a simplistic fear reaction. That Wells deliberately made us look at Moreau’s creations via Prendick's eyes means that regardless of their own innate value, we are asked to view them as abominations. The new imprint from Oxford World Classics does a wonderful job at presenting the story at its best. Wells would often revise his stories adding and eliminating elements depending on the target audience and his inability to stop tinkering. The book contains a twenty-five-page scholarly introduction which places the story in its original socioeconomic context. It also delves into the many themes in the book. Like the other books in the series it has a bibliography and a chronology covering the most important milestones in Wells's life as well as the original publication date of his most notable works. Given the passage of time and the change in language nuances the book also contains explanatory notes, which explains both words, ideas and fact which the modern reader may be unaware of. Moreau reminded me very much of Lovecraft’s work, great in building narrative exposition, but the denouement suffers from the passage of time, unfortunately beasts made man are as much the stuff of nightmares as a squid waving its tentacles.